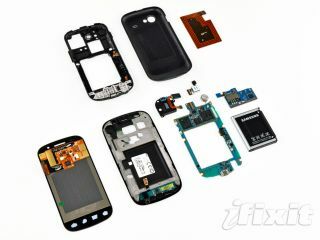 The Google Nexus S handset has been given its customary teardown by iFixit who have admitted they are impressed by the contour display and the inclusion of NFC technology. The NFC sensor is described as 'straight out of Tron' but the rest of the phone's innards are a little more as you would expect. Those parts include the 1 GHz ARM Cortex-A8 Hummingbird Multimedia Applications Processor based on the ARMv7 architecture, the 16GB of internet memory and the 512MB of RAM. iFixit professed that the phone's motherboard was 'peculiar to us' because it has a giant hole in the middle to enclose the battery. And, a word of warning: "If you shatter the front panel glass, the SAMOLED [Super AMOLED] has to be replaced as well -- they're fused together." The site gives the phone a seven out of ten on its repair scale (ten being the easiest), which it can proudly display along with the four stars it won in TechRadar's very own Google Nexus S review.